Namo Light | De B.A.A.T. Not just another responsive theme! 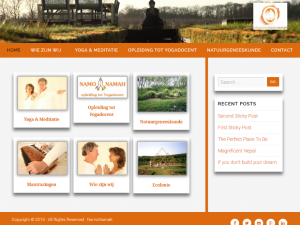 The first theme for Namo Lite is clean, lightweight and fully responsive. Its not just another responsive theme – its a unique responsive theme with an attractive masonry blog layout. On the back-end it uses the user friendly theme Customize panel which allows you to easily customize your blog’s header, menus, widgets, background color and image. Upfront its a retina ready, two-column, state-of-the-art blog that will help you reach out to your target audience and their various internet-enabled devices. Responsive design, Theme Customize, Custom Logo, Fav Icons, Custom Menu, Grid Home Menu, Sticky Post, W3C validated, supports social media. Please follow the steps below to install and customize the theme. Download the template file: (namo-lite.zip). Login to your wp-admin account and go to “Appearance -> Themes“. Select “Add Theme” and click on the “Upload” button on the top of the page. Select the downloaded “namo-lite.zip” and click on “Install Now” button. In case of errors, use an alternative method. Unzip the template file (namo-lite.zip) that you have downloaded. Upload the entire folder (“namo-lite“) to your server via FTP and place it in the “/wp-content/themes/” folder. Do not change the directory name. The template files should be there now: /wp-content/themes/namo-lite/index.php (example). Now click on “Namo Lite” – “Activate” button to activate the theme. Customize your theme via the “Appearance -> Customize” page (in the WP admin panel). Now click on the link to “Complete the setup now.” to enable automatic updates. Enter the “License e-mail address” and “License key“. You can order a FREE valid license key by sending an email to “namolite@de-baat.nl“. Login to your wp-admin account and go to “Appearance -> Customize“. Select Site Title, Tagline & Logo tab. Upload the logo image that you require. Login to your wp-admin account and go to “Appearance -> Menus“. Create a Home Menu, you can give it any name you want, just assign it to the Home Menu theme location. Here you can add pages to the menu which appear on the home page in a three-column grid. Each menu item shows an image and the title of the page. The image shown is either the featured image assigned to the page or a default image defined by the theme. Create a Social Menu, you can give it any name you want, just assign it to the Social Menu theme location. Here you can add your social media Links as menu entries which appear at the bottom of the site in the footer. Supported social media include Facebook, Twitter and Google+ and many others. grey, two-columns, right-sidebar, responsive-layout, custom-background, custom-header, custom-menu, featured-images, featured-image-header, featured-images, flexible-header, full-width-template, translation-ready, sticky-post, threaded-comments, editor-style, theme-customize.